Editorial illustration by Cyrus Reed. October marks the beginning of the holiday season, the onset of fall and the spooks, ghouls, ghosts and goblins that make it obvious it’s time to dress up in silly costumes and eat yummy mallow crème candy corn and Reese’s Peanut Butter Cups shaped like pumpkins. For community college students, though, it can be a time of high stress as we look to finish our last few classes before graduating with our first degrees. On the other hand it can also be a time of excitement for those students just starting college, either following high school graduation or coming back to school for one reason or another. Statistically speaking, the résumé probably does more for a student—or former student—than the degree. at’s not only a sad reality, but like a papier mâché ghost dropping down from a tree as kids walk up to a house hoping to add more candy to their pillowcases, it can be terrifying. That’s not even the most hair-raising part of the findings. “The research also reveals that, despite their degrees, nearly two-thirds (63 percent) [of the recent graduates surveyed] say they will need more training in order to get their desired job,” according to an article posted on newsroom.accenture.com. 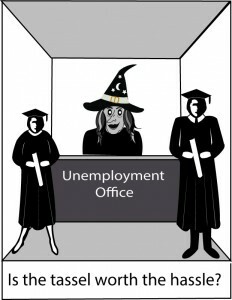 Not finding a job right after graduation can also make students’ spines tingle as they regret taking out all those students loans instead of getting a job to help pay for school. Then there’s what might just be worse than Freddy Krueger taking a victim to the depths of hell during a middle-of-the-night scare fest: the thought of going back to school because your career choice just didn’t pan out. Perhaps there just aren’t enough jobs out there. Maybe you didn’t take the time to explore all of your options, or lack thereof, within the field you chose, or maybe you just simply don’t like the career field you worked all those years to get into because it didn’t turn out to be all it was cracked up to be. But no matter what keeps you up at night, makes you want to sleep in till noon or simply keeps your hair looking like Medusa as you fantasize about turning your professors to stone because they had the nerve to give you so much homework, when it comes down to it, going through college and finding a job in a career field that interests you is one of the hardest tasks you have to complete in life. Making the wrong choices now could mean a lifetime of unsettled rage toward your younger self. The good news is that there are plenty of things that can be done to ensure this ghastly fate doesn’t become a reality. Internships can help students decide whether they are well-suited for the career they’ve chosen. Vocational programs take this one step further since many of them have students working, to a certain degree, in the fields of their choice. There are also career fields like journalism, graphic design, computer programming and many others where it isn’t really possible to learn the field without going out and doing the work. This is great because it forces you to try before you buy, so to speak. Regardless of the career field you choose, keep in mind that like wearing a silly costume to class on Halloween, it’s a decision that will stick with you for a very long time. If you’re unsure about the choices you’ve made, talk to a counselor, a parent, someone working in that career field. Make sure you are prepared before you set foot on stage to accept that degree because you don’t want your life turning into a scary movie. This entry was posted in Editorial, Sac City Express (SCC) and tagged careers, college, community college students, degree, diploma, Express, Halloween, jobs, resume, sacramento, students, unemployment. Bookmark the permalink.